Want to invoke the protection of St. Michael the Archangel to your home? Having an St. Michael the Archangel statue in or around your house, will awaken a sense of safety and security and the help from the »heavenly host.«. The mission and importance of this leader of the angels were explained in the article Prayer to st. Michael Archangel. You can also read Names of Angels in the Bible to understand how can Angels protect you, your family and your home. St. Michael the Archangel is an Angel with the highest mission in the Church. His task is the battle against Satan. He is saving our souls from the power of the spiritual enemies. Artists portray him as a warrior with a sword in his hand. Why buy St. Michael statue? The Catechism of the Catholic Church states that Holy statues proclaim the same Gospel message that Holy Bible communicates by the word. Additionally, they help to awaken and nourish the faith of believers. If you believe in mission and power of St. Michael, his image will bring you tranquillity and sense of protection. A statue which depicts St. Archangel Michael can make great Baptism and Confirmation gifts. As sponsor or parent you can give your Confirmandi a statue of St. Michael especially if angel matches his/her Confirmation name. Godparents can gift their Godchild who are baptized under the name of Michael. Saint Michael the Archangel is the protector and guardian of the Catholic Church. In addition, he is the patron saint of artists, banking, dying people, fencing, grocers, police officers, and soldiers. St. Michael Archangel statue also makes great decorative accents for your home, garden or office. Removing material until you reach the desired shape. (top-down approach). Casting material into a mold (bottom-up approach). Small figurines and statues available in the religious stores are made by using casting process in which a liquid material is usually poured into a mold. An object can be created with different materials such as clay, resin, stone, plastics, fiberglass, glass, some metal alloys (bronze, cast iron, gold, silver), ceramics and a mix of mentioned media. Majority of St. Michael statues available online are made of pure resin or resin mixer with stone. Beside on material you should pay attention to how a product is finished in term of color and details. It is very important to buy from trusted stores online which offer high-quality products from well-known manufacturers or distributors. I am sure, you do not miss if you buy from The Catholic Company store (my review can read here). They offer more than hundred St. Michael the Archangel statues of different material, design, shape, and size. For many of you, Amazon is the favorite place to buy a religious item as well. 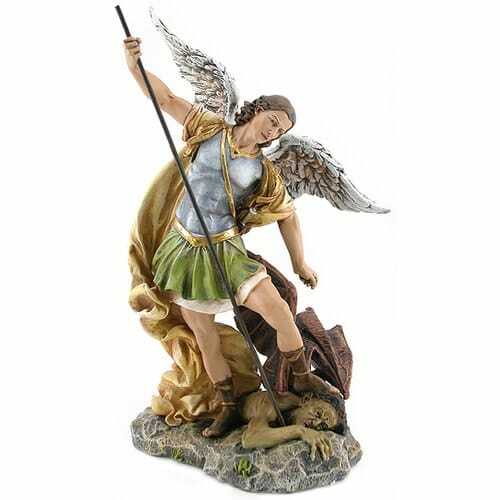 There I found many statues and figurines of St. Michel Archangels in a variety of sizes and styles designed to meet your unique needs. I found some beautiful statues and figurines both for garden and indoor ones at Design Toscano. Even though Design Toscano is not religious store, they hold a remarkable collection of angels and Saints statues. The artists portray St. Michael Archangel as a warrior, armed with sword, shield or helmet. The shield may bear the Latin inscription Quis ut Deus. He may be standing over a serpent, a dragon, or the defeated figure of Satan, whom he sometimes pierces with a lance. We carefully check, read and analyze all customers product reviews. Every review gives us an important information about a product. First of all, how buyer expectations were meet and if the product is value for the price. You should do the same before you decide to buy any product online. If you are looking for St Michael Archangel statues we have reviewed a large amount of different material, size and shape online. Below are some more beautiful and popular ones online. This gorgeous statue of St Michael is made after Italian painter Guido Reni. His original image of archangel can see in the church Santa Maria della Concezione in Rome, Italy. A statue is sculpted in real bonded natural marble with quality resin. You will love the fine details, especially the amazing perfection of Arcangel face. Each piece of a statue is individually hand-finished. Customer review: As mentioned previously by other buyers, this is a gorgeous statue and the details are amazing. Quite heavy but that’s to be expected. Am very happy with this purchase and planning to purchase another one soon as a present. This statue of St. Michael the Archangel” is sculpted in high-quality bonded natural marble with resin and hand finished. With an astonishingly detailed image and the strong diagonal line indicated by the thrust of his sword, this work of museum-quality art is a testament to St. Michael’s strength. application of law and justice in society. The scales of Saint Michael also depict justice, but of another type. the advocate of justice and mercy in perfect balance. According to Catholic tradition, on Judgment Day St. Michael will weigh souls based on our deeds during our life on earth. Even bonded marble resin is waterproof and UV resistant and statue can “survive” outdoor, I recommend using this beautiful statue for indoor use. It will look nice on the table, shelf or mantle. A statue is 14.5″high from bottom to the top of his right wing and it is not too big to put it in your leaving room, kitchen counter or office. I am sure it will grab a lot of attention. 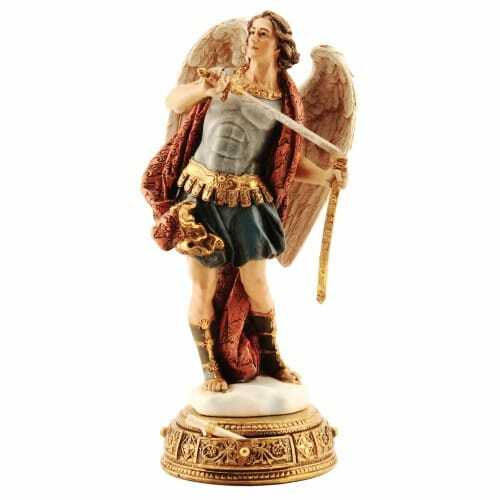 Description: This St. Michael the Archangel statue is recommended highly rated, well-priced products available to ship immediately. It is made from real bronze powder mixed with resin. Hand-painted in the bronze finish gives a high-quality look with amazing details. A product is 15 inches high. Big enough to gain the admiration and small enough to fit in any place in your home. You will receive this gorgeous bronze statue of Saint Michel Archangel packed with molded styrofoam in beautiful gift-box. To avoid damage read attached unpacking advise. The sword is made of plastic. 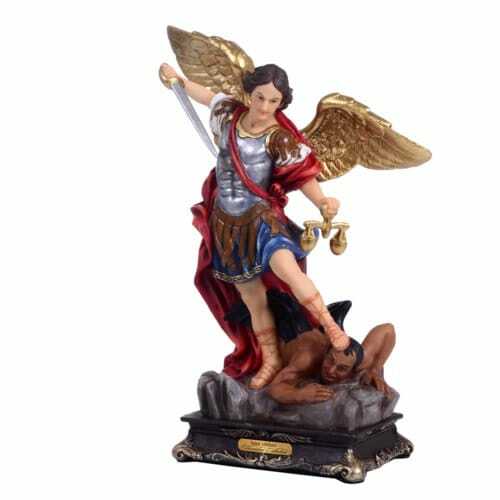 Description: If you prefer small multicolors statues, this St. Michael statue is right for you. Guardian and defender of our souls is impressively portrayed here. This statue features the reach color with gold wings, Archangel Michael, crushing the devil underfoot. The product is hand painted and extremely beautiful detailed. A statue is made of resin in Italy and belongs to new series of statues named The Florentine Collection. Products of this collection are sculpted by a master artisan and inspired by the stunning statues seen in Italy’s churches. Statues are hand-painted and accented with golden highlights. If you order this nice St. Michael statues with beautiful details, you will get it in few working days. Description: Don’t want to watch the devil in your home? Here is St. Michael statue without devil under his foot. The product come from Heavenly Protector Collection by Joseph’s Studio, which is one of the Roman well-known collection. Roman Inc. is a producer and exclusive distributor of more than 5,000 gifts and decorative accessories. Description: This gorgeous statue by Joseph’s Studio is a part of the Renaissance Collection. The figure depicts St. Michael defeating Satan. It has amazing details. St. Michael’s sash and belt have gold accents for an artful and rich presentation of the Heavenly Protector. Owners of this 12 inches high St. Michael statue appreciate its attractive colorful design with gold accents. The product is made of a resin-stone mix. This statue is perfect for most any home or office. 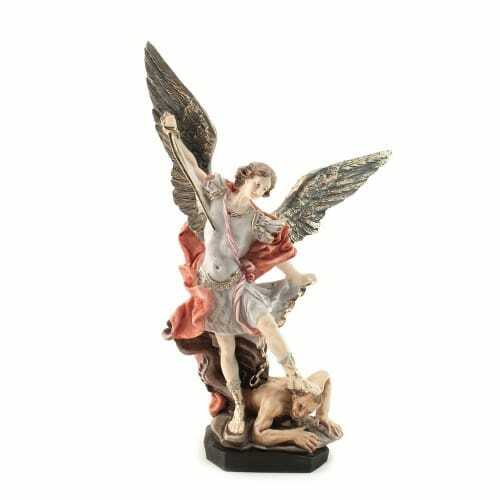 Description: This beautiful and lovely Old Word colors handpainted St. Michael statue is created by the popular Pelligrini family of artisans in Italy. An incredibly detailed image of great power and character, this colorful St. Michael the Archangel statue is solely sculpted in 3d. St. Michael’s face is unwavering, his arm is powerful because he readies his sword for the death blow, his wings are glorious, and the armor shines. St. Michael is the patron saint of individuals in the military and public protection services. This handpainted statue of Saint Michael can be enjoyed year-round on a shelf or mantle in your home. He is shown sheathing his sword to represent the finish of war and conflicts, and to create peace within the lands. A product is a bit different from a lot of the St. Michael statues. Maybe you like it because it’s not the traditional St. Michael crushing the demon head. You will feel totally protected when you look at it. Description: This masterpiece is created after a 1636 painting by artist Guido Reni. You can admire one of the most popular images in European art in Santa Maria della Concezione (Our Lady of the Conception) Church in Rome, Italy. Grand scale and an astonishingly detailed sculpture of St. Michael is greater than four-foot-tall. Archangel is cast in quality designer resin and finished with faux stone to replicate fine marble. With outstretched wings and powerful diagonal line shown by the thrust of a sword, this investment in quality art depicts St. Michael defeating the demon. Shiping weight is about 108 lbs (49 kg). Due to this fact statue is shipped in four pieces. I am sure you will not have any trouble to set it up. Description: This massive statue, “St. Michael” depicts St. Michael the Archangel entrenched in a fight with Lucifer. This is a beautiful garden or home decor that brings a statement of Saint Michael’s protection and his intercession over your family. The statue stands 46 inches tall, is 30 inches wide and 18 inches deep. Made from cold cast resin, it features a metallic bronzed finish for outdoor display. It has hands-colored accents, allow it the feel of metal. The detail is incredible, in the individual down on Michael’s wings, to the feeling of disgust on Lucifer’s face. The nice statue of Saint Michael appears great in lobbies, foyers, and offices. You shouldn’t lose out on this awesome piece at a great cost. Next What Does the Bible Say About Wisdom?